Revels case studies: we currently have 1. 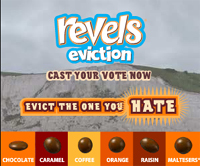 Using the idea of reality TV shows and voting for eviction, this campaign is about the idea of evicting one of the varieties of sweets. It’s a neat way of riding a current social trend with creating simple interaction within an advertising format. For fast moving consumer packaged goods brands like Revel’s, they’re not trying to sell off the page, their goal is to build brand image, discussion and front of mind awareness. That’s exactly what this creative achieves – even without deep interaction on the website.